Puerto de San Miguel, Ibiza. Medium sized sandy beach, protected by pine covered hills and steep cliffs. Getting there: Reached by hired car or bus, well signposted. Parking is good. Buses run regularly to the village of San Miguel, 5 km to the south. The tiny resort of Puerto de San Miguel, formerly the fishing port of the charming village of San Miguel, just 5 km to the south, has a stretch of soft sandy beach by the calm blue sea. Protected by pine covered hills, delightful for walking if you don't mind the climb, the medium-sized natural sand beach has crystal clear waters which are ideal for swimming and water sports. Waterskiing, windsurfing and scuba diving are available, whilst there are sunbeds and sunshades for rent on the sands. Though small, the resort itself does have some souvenir shops and a small supermarket for basic necessities. A good place to relax after your visit to the dripstone caves of Can Marça, where you will be transported back in time to retrace the ancient footsteps of infamous smugglers of bygone days. Several bars and restaurants line the beach, including the Port Balansat - known as one of the best fish restaurant on Ibiza. Locals come from all over the island to eat 'Bullit de Peix', the typical Ibicencan fish dish. In the small resort of Puerto de San Miguel there are both hotel complexes and self-catering apartments. 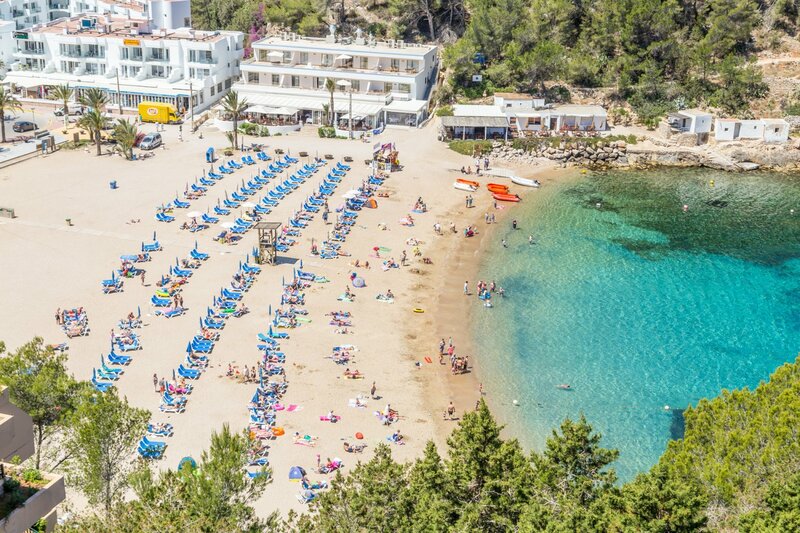 This resort makes for a holiday with nice and tranquil surroundings and is only a 20-minute drive from Ibiza Town. The Can Maries Country hotel is a calm oasis just 900 metres from the beach, offering lovely views of the surrounding green hills and the sea in the distance. There is also a great choice of holiday villas in this beautiful northern part the island - perfect and very affordable when travelling as a large group or family.